Mineral makeup brand Mirabella Beauty launches a DIY video instructing how women can brighen their face with Blush! Colour Duos. Jasmine Dashtizad, celebrity makeup artist says "We create a natural radiance by creating structure and dimension using the darker shade below and the lighter shade above the cheek bone, then blending." Blush Colour Duos blast winter blues and brighten a woman's face with mineral makeup brand Mirabella. Use the perfectly-paired gluten-free, paraben-free, talc-free mineral matte shades to create a naturally radiant, healthy glow. Duo shades can be used separately or together for a contoured look. 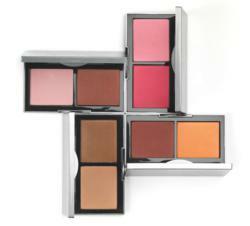 This Duo Blush will invigorate the face with color. Watch the video tutorial to see how simple it is to use blush to flatter bone structure and highlight features. Blush Colour Duos bring cheeks to life. Jasmine Dashtizad, celebrity makeup artist says "We create a natural radiance by creating structure and dimension using the darker shade below and the lighter shade above the cheek bone, then blending." Available in four color pairings to match your mood. Feeling Merry? Radiant? Blissful? Maybe Glowing? Mix and match palettes together for a custom look. Mineral formula is Talc-free, Oil-free and Paraben-free. The whole line of Mirabella Beauty makeup is available at http://www.mirabellabeauty.com. Jasmine’s career in makeup took an unconventional path. She became enamored with it as a child as she would sit entranced watching her mother do her own makeup. It was the power that makeup possessed to enhance a woman’s strength and femininity that ultimately influenced her decision to become a makeup artist in college. With no formal training, but fueled by an intuitive knowledge of light, color, and balance, she began working with cosmetics and beauty manufacturers to create their advertising imagery. Her work encompasses a wide variety of assignments; print, fashion shows, and music videos. As the National Trainer for Mirabella Beauty, she has assisted the company, developing seasonal collections and new product innovation.